Wade Gordon Signals is a binary options trading service that doesn’t use any unreliable robots are trading algorithms. The developers of the system tell us that they only use professional trading strategies to identify the very best binary options signals for their clients. Today I’ll be reviewing this software so the binary today readers understand if it’s a profitable signal service, or another bust. 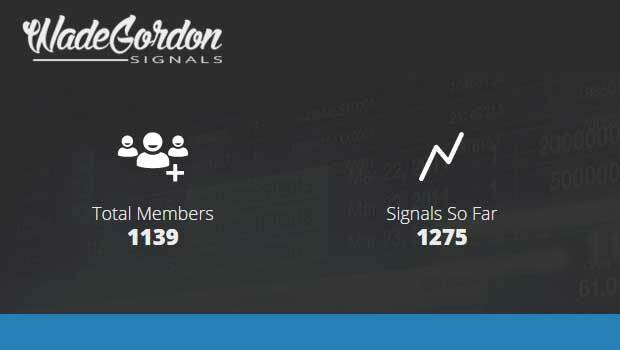 According to the Wade Gordon Signals webpage this service has over 1100 members, a win rate of 73% over 1275 signals at an average of 5 signals per day. I’m really not in a position to say whether or not this signal service truly hits these numbers but it’s something we certainly have to take into consideration in this review. The domain for this website was registered on 2015-07-18, which is about 5 months ago. Considering I haven’t heard about this signal service until today I find it very difficult to believe that they have over 1100 clients. The most popular systems in the binary options market generally take around a year to hit that number and it really doesn’t look like any of the binary options review websites are promoting the signals either. That being said, it doesn’t mean that the Wade Gordon Signals service is a bad one. It just means that I believe they don’t have as many clients as they claim. This is pretty common online anyways as product promoters want to make their systems seem valuable and important. Wade does provide us with a brief history of about 20 trades from the 10th of December until the 23rd. This isn’t a very large sample size. I was expecting to see over thousand signals as that’s what they are claiming on the sales page. Maybe that’s somewhere else on the webpage but I’m not seeing it. The recommended broker for the signals is 24 option but this is a lower rated binary options broker here at binary today so I don’t recommend it. At this point in time I’m currently on the fence about whether or not I should recommend the Wade Gordon Signals service. The webpage is professional but there are obvious discrepancies that I’m not sure I can sign off on. I really don’t believe that this service has as many members as they claim and that makes me wonder if there win rate is fabricated as well. I’m in a position here were I’m doing a lot of guesswork so I’d like to hear from the community to find out if this software is really working. If there truly are 1100 members I’m sure my review will have comments within the next few hours. If you have something you would like to say please leave your comment now.